That’s where we come in! Below we’ve listed our go-to vegan online resources. Keep them bookmarked to help answer questions as they arise, get inspired, and ensure you stay both healthy and energized. 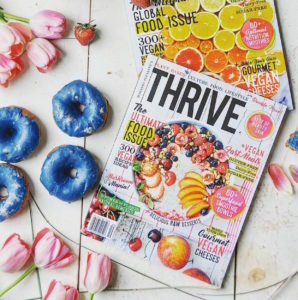 Basic Gist: Thrive is a one-stop-shop for everything you need to life your best plant-based lifestyle: interviews with famous vegans, deep dives into the benefits of different herbs, and recipes for smoothie bowls that will make your mouth water. Awesome Feature: It’s a magazine so you can digitally download each issue to take with you wherever you go; perfect for traveling or commuting. Plus a yearlong print subscription is less than $50 if you’re old-school and love the feel of glossy pages. Basic Gist: The non-profit organization touches upon everything from health to ethics to world hunger and beyond, with tips on vegan pregnancy, egg substitutes, dairy-free sources of iron, protein planning, and much, much more. Awesome Feature: Curious what the USDA’s new version of the food pyramid, MyPlate, would look like in a vegan form? Head to The Vegetarian Resource Group for a colorful depiction alongside hours’ worth of reading material on plant-based nutrition. Basic Gist: This eco-conscious site provides a mix of easy-to-execute recipes, vegan-based news stories, and consumer trend insights. Cute animal videos and articles about vegan celebs are always on rotation for a quick, but positive, distraction. Awesome Feature: The site hosts sections catered to plant-powered athletes, those seeking product recommendations, and cooks looking for dairy-free hacks (like the best way to pull off a cheeseless pizza!). Basic Gist: The key to maintaining any healthy diet, vegan or not, is to always keep the fridge stocked with produce. Of course, the best tasting fruits and veggies are nearly always the ones that are in-season and locally obtained. To help you seek this out, the USDA has set up a site to designed to locate the farmers markets nearest to you. Awesome Feature: Simply type in your zip code, and the register will pull up all of the markets in your area. But it doesn’t stop there. You can also find directions, operating times, and accepted forms of payment for each market. Basic Gist: It’s like Yelp for vegans—but even better. Whether you’re on the road or seeking a local spot to score meat-free eats, Happy Cow allows you to type in a city and see what vegan/vegan-friendly restaurants are nearby. Awesome Feature: From each listing, users can read customer reviews, view user-submitted photos, check out the restaurant’s estimated price level, and instantly access the restaurant’s website and contact info. Basic Gist: It may come as a surprise, but many alcoholic drinks are not vegan. 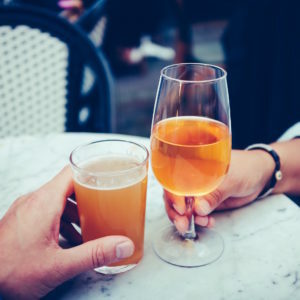 Brewmasters, winemakers, and distillers often include animal ingredients in their products (such as honey or milk) or utilize them in processing steps (like with fish bladder, used to help filter out impurities). Fortunately, Barnivore enables you to find out whether your favorite beer, wine, or spirit is vegan with the simple click of a button. Awesome Feature: If your favorite brew isn’t listed, Barnivore provides instructions on how to send an inquiry to the maker to get the beer listed onsite. Basic Gist: Having trouble deciding what to make for dinner? Navigate to Finding Vegan where your eyes will help you choose. Here, you’ll find pages upon pages of photos depicting 100% vegan food. Each mouthwatering picture links to a recipe from blogs and sites around the internet, allowing you to recreate it. Awesome Feature: The community boards connect you to likeminded vegans who can help answer any question you may have, from the right natural deodorant to the best vegan restaurants in any city. Okay, so this is really a four-in-one. But there’s nothing better than finding a food blogger you can trust to deliver delicious and nutritious plant-based meals straight to your computer. Our favorites include Oh She Glows, serving up healthy meals ranging from burgers to Buddha bowls, Thug Kitchen, where playful (and profane) writing meets simple-but-craveable recipes, and Green Kitchen Stories, which is 100% vegetarian but not completely vegan, produces some of the most beautiful dairy-free dishes we’ve ever seen. And don’t forget Purple Carrot’s rolodex of fresh, plant-based recipes.